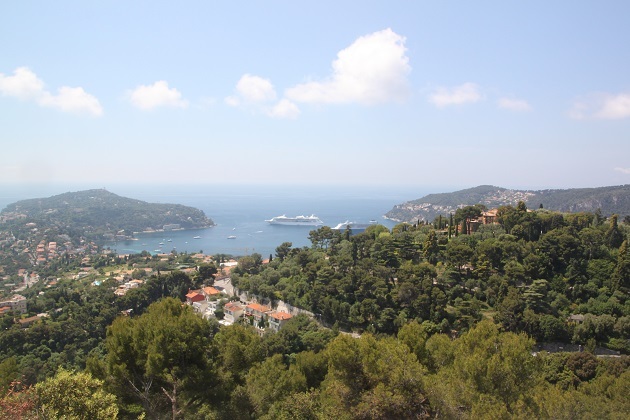 Our last full day on the Cote d’Azur, we packed a picnic, left Cannes and headed off to explore and drive along the spectacular coast road known as the Moyenne Corniche. There is absolutely no better way to appreciate the natural beauty and diverse character of this place than by driving one of the coast roads. There are actually three, they are parallel and each delivers a different perspective on the Riviera. The lowest road passes through the coastal resorts and apparently is always busy and can take a long time. We opted out of that due to time constraints and decided to allow a day to drive the Moyenne and Haute Corniche with plenty of leisurely stops thrown in for good measure. Husband did his homework. He read the best way to do all this is take the Middle or Moyenne Corniche out of Nice and drive the Haute Corniche back. The middle road is two lanes in each direction and extremely busy. It does have no end of parking places though where you can pull up safely and admire the views. The views are also on the correct side of the road – you don’t need to cross. The Haute Corniche is one lane in either direction and you do have to cross the road to take in the views. However it is easy to park just off the road and it’s not busy at all. This all worked a treat for us – I would definitely recommend this approach. Obviously driving Monte Carlo to Nice you would do it the opposite way round. In Nice we found the signs for the Moyenne Corniche (relatively) easily. At first it was just urban views but as we climbed and left the city behind, the views started to change and became spectacular. The Middle Corniche clings to the rocky backbone of the escarpment as it winds through the Mediterranean landscape. 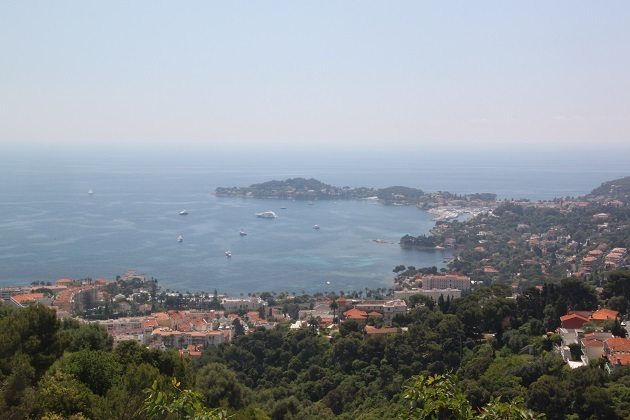 The views of the coast and the Riviera’s towns and villages below are just amazing. 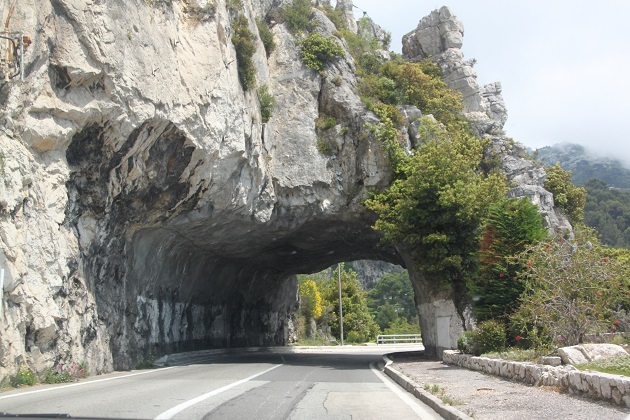 The road was built between 1910 and 1928 and they say it is less hair raising than the Grande Corniche – I didn’t find either to be a white knuckle ride but then to be fair, I wasn’t driving. Maybe I was just distracted by those views and Husband loves driving these kinds of roads. This was the road Princess Grace of Monaco had her tragic accident. Her car plunged mysteriously from the Middle Corniche. 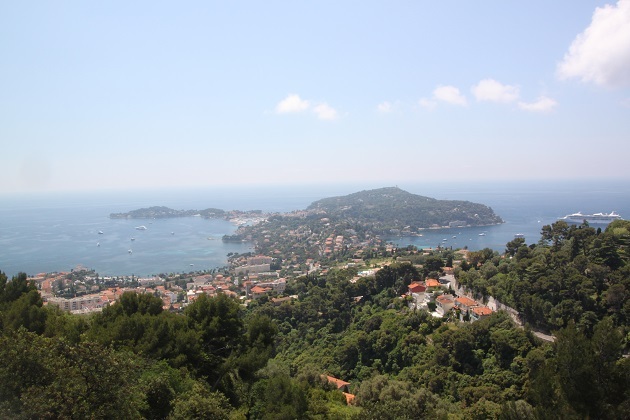 A real highlight was the view of Cap Ferrat and then the sudden appearance of the dramatic village of Eze, perched on a soaring rock and where we made our first long stop. I like your husband doing the homework. It makes a difference doesn’t it! Absolutely – that almost never happens! Some stunning views of the Côte d’Azur and good to know about the stopping places for photo opportunities, too. Have a good weekend! It was a great day – we stopped so many times though, glad we’d allowed plenty of time, those views were so tempting. Enjoy your weekend too – fingers crossed for sunshine! Wow! I wouldn’t like to drive that but John would love it and I would enjoy the views. That’s exactly how it worked for us!! I love picnic! I also make my boyfriend make the homework as well haha. Looks like amazing places and the nature wow. Love it! The views were just so incredible – a wonderful drive and I’m glad he did his homework!! Amazing isn’t it Pam – such a beautiful coastline. Just the thing to look at for me too on a grey and rather wet English autumn day! Have a great weekend. Little wonder they built a Rolls Royce Corniche! 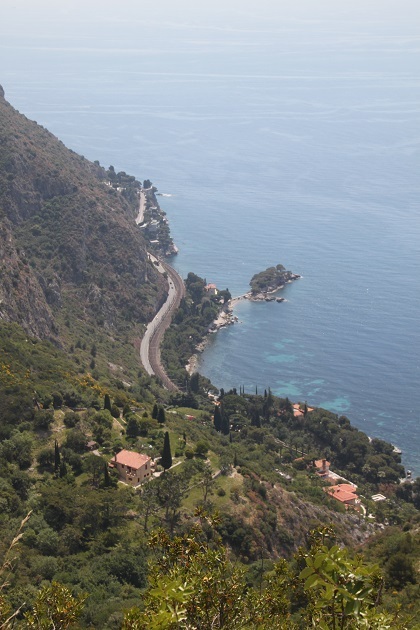 Have you done the Amalfi Drive? How did it compare? Unfortunately not – a place we’ve long wanted to visit not least to do that drive but never made it there yet! One day… have you done it? I have never driven it myself but have done it twice on a coach tour – quite stunning! Such a beautiful coast and views! Thanks for sharing. The views from this road are really something special – nice to look back on a grey English autumn day! The views are just incredible – we couldn’t help ourselves stopping, it became rather a long journey but worth it! I am not a huge fan of the Riviera though my parents had a house there for a long time. But those coast roads are quite amazing. They were my favourite thing, driving and stopping to take in those views was incredible. The scenery was amazing Rosemary, one of the most lovely roads we’ve ever travelled along. Glad I wasn’t driving though, being a passenger suits me so much better!! We’re enjoying lots of sunshine this weekend – hope yours is a good one too. 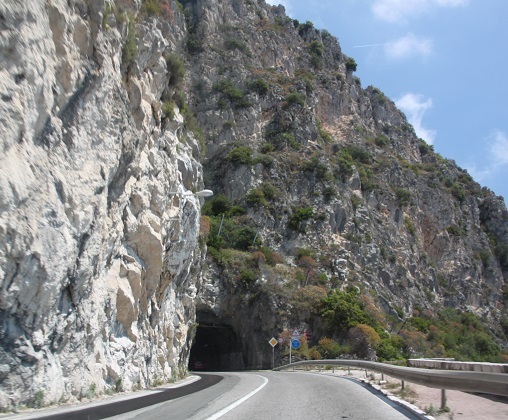 I took the bus from Nice to Monte Carlo on the Moyenne Corniche – cracking views when you haven’t got to concentrate on the road. 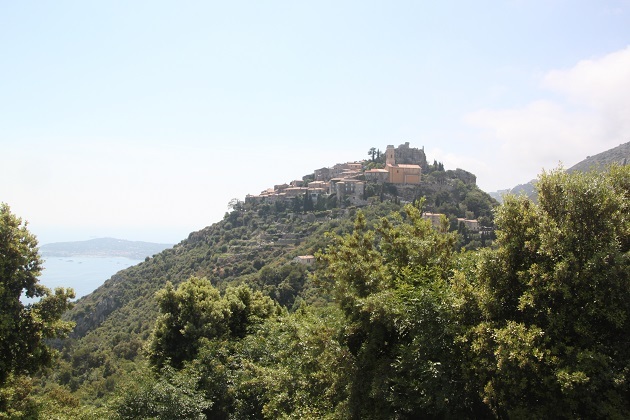 We stopped in Eze too – what a stunner! That’s a great idea taking the bus, we never thought about that but it means we all could have enjoyed those views. Loved Eze, ploughing through a stack of pictures we took there and you’re so right, it is a stunner. WE did this drive a couple of years ago. I was very happy when we got to Eze. I was just glad not to be driving. My husband doesn’t mind though…. thankfully! There is nothing like taking a drive along the coast with incredible views – gorgeous photos!! Totally agree, spectacular coastline makes for the best drive ever! Awesome photos of a truly awesome place! It really is a stunning stretch of coastline! 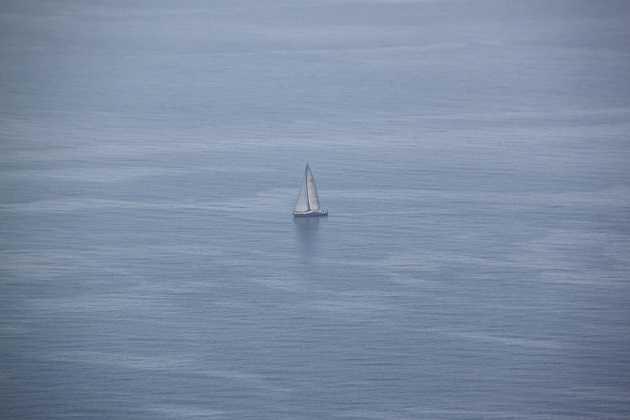 Absolutely – it meant I could just chill and look out the window, that suited me very well! !